← 73. St Boswells. 10 Nov 2017. The Kittocks is one of two courses on the Fairmont hotel complex just outside St Andrews. The resort was opened as the St Andrews Bay Golf Resort and Spa by the American pharmaceutical entrepreneur Dan Panoz in 2001, but has transferred ownership a number of times since. The sister course is the Torrance named after its architect Sam Torrance the Scottish golfer. Both courses are championship venues and have hosted major qualifying and senior events. The Kittocks course was originally called the Devlin after its golfing designer, the Australian Bruce Devlin, who developed the course in partnership with Denis Griffiths, the well known designer and past President of the American Society of Golf Course Architects. The Kittocks is named after an area of land on the course which is inhabited by a family of deer. Until recently, both courses had a headline Summer rate of £140, although new management has repriced it at “only” £95. I say “only” to highlight how crazy, in my opinion, golf prices in Scotland have become at the higher end of the market – Kingsbarns, only a couple of miles away, is £268 for a 2018 summer round! Assessing “value”, my key course assessment, is inevitably subjective, especially considering the different types of golfers each course targets – Kingsbarns starter box has a toll free American number! Comparing “value” between Kingsbarns (£268), St Andrews New (£80), Scotscraig (£70), Tain (£60), or the Kittocks at £95, is highly debatable….but good fun! The Kittocks has many original links design attributes, including 2 double greens (the 1st and 13th, and 7th and 10th), deep and revetted bunkers (although slightly oddly built), whispy rough, boundary dykes and several dune like mounds. The layout is a mesmerising number of interlinking horseshoes, meaning wind changes direction from hole to hole. The very clever use of contours and rough means each hole feels isolated from the others displaying high level architecture. 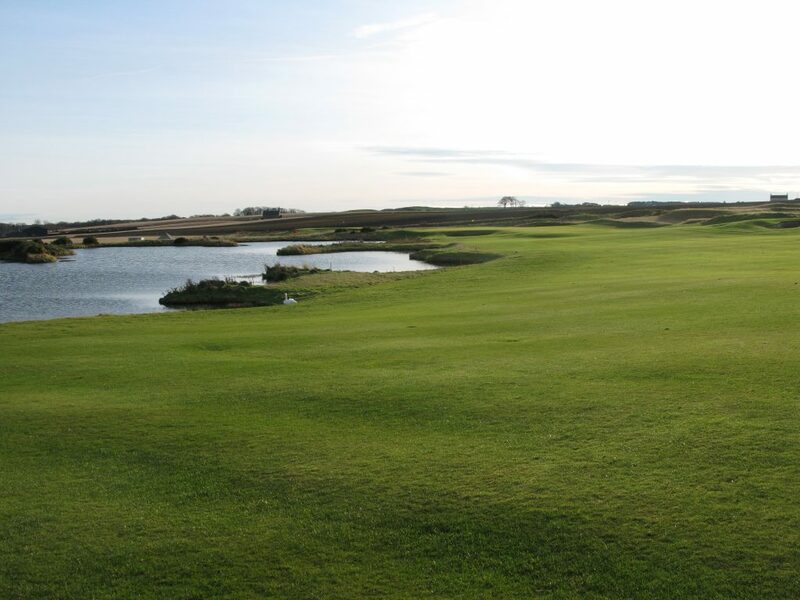 After a fairly straight forward par 5 opening hole, the very picturesque 2nd hole, with its manufactured lake along the left, lets you know this course is not trying to be a classic links design. The 4th hole, stroke index 1, is the first of several very difficult holes, where a long second shot is needed over a deep gully into a green surrounded by gorse. Having hitting my best drive and 5 wood of the day, my ball was never to be found again in the gorse to the left of the green! 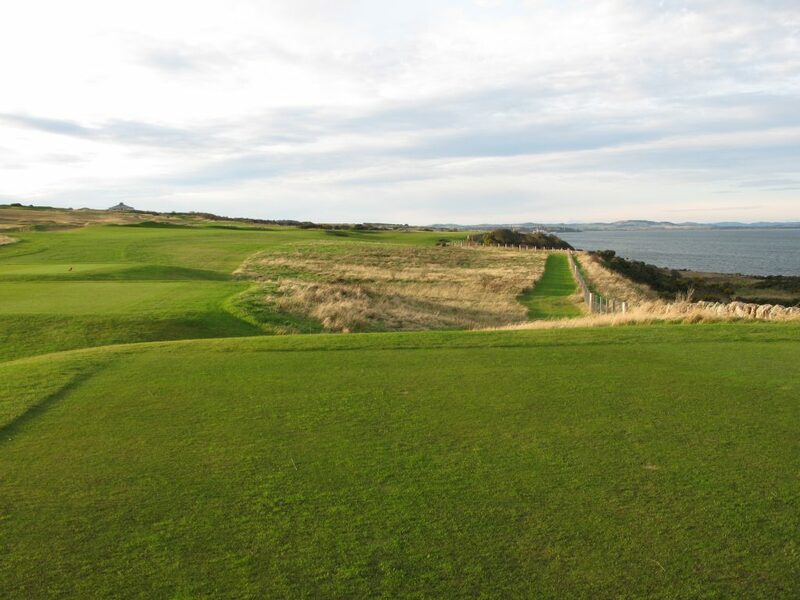 The course then winds down to the North Sea, with the dog leg par 5 5th hole presenting one of the few blind tee shots on the course, with its green giving outstanding views back towards the “Toon” of St Andrews. After the nice par 3 6th hole you then reach the signature par 4 7th hole, which has a great vista showing the unusual bunkers and, finally, the huge double green. There then follows a range of nicely varied holes, whereby there is no stretch of incredibly difficult back to back holes. Looking at the stroke indexes on the card you see how balanced the course is. 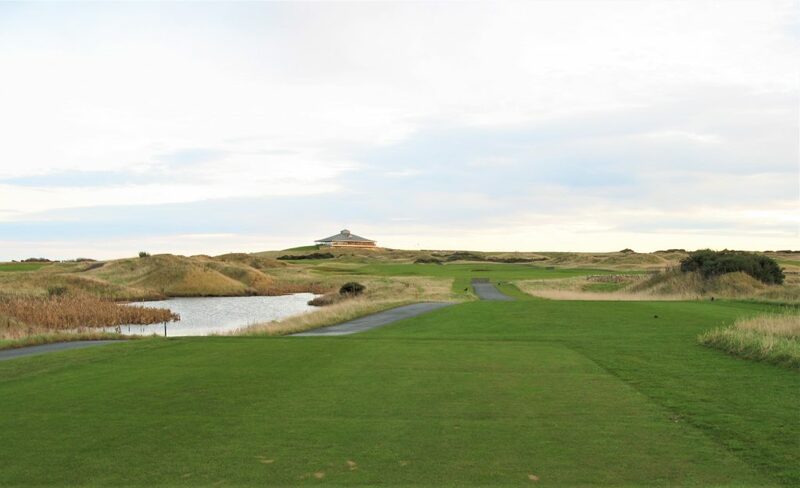 The 10th presents the first time the combination of the prevailing westerly wind really comes into play along with the sea tight along the right of the fairway. The highlight for me, both visibly and playing, was the difficult par 3 16th hole, where the yellow tee of the day had been mischievously placed on the championship tees, giving me a slightly uphill shot of almost 200 yards into a 15 mph wind – I didn’t lose my ball! Its worth noting that there are a range of tee options with big differences between the blue/white/yellow/red tees, suiting all standards. The final 2 holes were originally part of the Torrance course, but incorporated into the Kittocks after a redesign in 2009 and present 2 very fine long par 4s to finish. The course was in great condition for a December, with full tees and greens in play. The course is quite open with wide fairways and the greens were surprisingly fast. The greens are generally very large, and I imagine not many amateurs will go without 3 putting the odd green – I did it 7 times….ouch! Along with 2 lost balls, this was the reason for my gross 101 for 25 stableford points. If you are looking for a golf resort whilst in St Andrews, the Fairmont offers a great location with the fees for unlimited golf on both courses during your stay being very reasonable and much better value than a single round. I got a good deal with a winter fee of only £30, but my score of 3.5 represents a value at £95 per round. 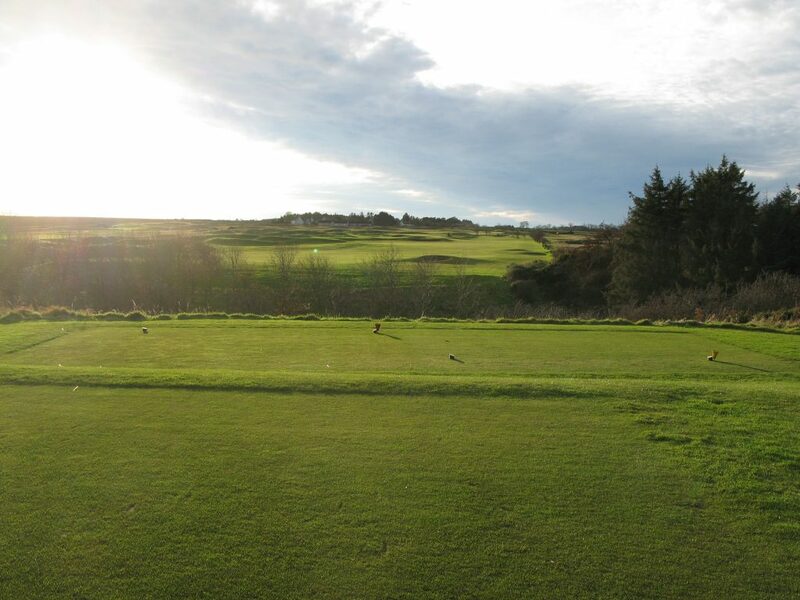 This entry was posted in 18 holes, 3.5 star, 4 star, Bruce Devlin, Commercial, Course Architech, Course Owned By, Course Quality, Course Type, Denis Griffiths, Holes, Links, Overall Value, Price, Region, Since 2000, The Kingdom of Fife, When Course Established, £80 - £99. Bookmark the permalink.